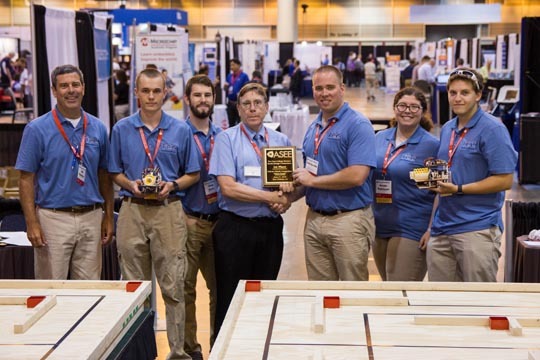 Tidewater Community College engineering students spent part of the Summer Session designing and building robots to race during the American Society of Engineering (ASEE) Model Design Competition, held in New Orleans, June 26-29. Students on the Chesapeake Campus in the Science, Technology, Engineering and Math (STEM) club took first place in the national competition that included 16 teams. The Engineering Club from the Virginia Beach Campus took second place and TCC students participating in the Apprentice School for Newport News Shipbuilding took fourth place. “I could not be more proud of our students. They really pulled together, from the planning phase to execution, to make this success happen,” said Professor Bill Simmons, student mentor and STEM club advisor. Ian Lenda, Chesapeake Campus team leader credits the competition with helping him land his rewarding apprenticeship at Newport News Shipbuilding. The ASEE competition is a design/build robotics event open to freshmen and sophomore engineering and engineering technology students at both 2-year and 4-year colleges. The goal is to give student teams an opportunity to use the engineering design process to build an autonomous vehicle to complete a specified task or to complete a specified track. Teams face realistic challenges, such as constraints on cost, size, batteries and, of course, time. Student teams not only have to build a vehicle to navigate the specified course or complete a specific task, but also have to give presentations before a panel of judges. TCC’s students have participated in the ASEE Model Design Competition since 1999. Engineering Professor Paul Gordy was the first faculty member to prepare a team for the event. “The competition helps our students see engineering as more than just an academic exercise. The practical knowledge and confidence they gain is invaluable,” he said. The TCC teams used 3D printers and laser cutters to build their robots, which were funded by the Chancellor’s Innovation Fund grant. 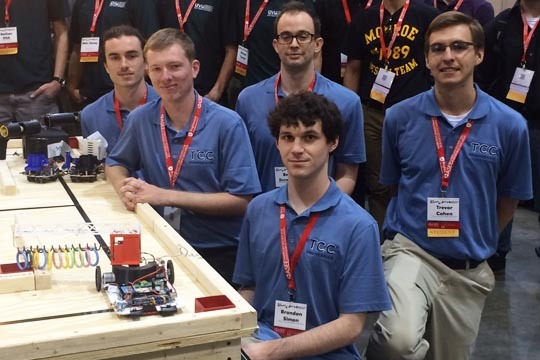 This is the first time since 2004 that a TCC team took first place in the ASEE competition.